I will share an overview of how I performed the previous week. I will cover a topic of importance that will help you in the area of fantasy sports. On Monday, I took off for the first time since fantasy sports relaunched in New York. I had a lot of work to do on my blogs, so I didn't play any contests that day. On Tuesday, my week started getting better. I entered 12 MLB DraftKings contests and won 8 of them. Wednesday was even better. I entered 11 MLB DraftKings contests and won 10 of them. Thursday, I entered NFL DraftKings contests for the Thursday to Monday slate. I entered 16 contests and only won 1 of them. Friday, it was back to MLB baseball. I entered 13 MLB DraftKings contests and won 11 of them. On Saturday, I played fantasy MMA, participating in the UFC Fight Night event. I entered 12 contests and won 7 of them. Finally on Sunday the bad streak in football continued. I entered 16 contests and only won 1 of them. It's actually crazy football was one of my best sports last season. This season it has been a disaster! Season long fantasy football hasn't been much better. I have 4 teams. 2 in money leagues and 2 in leagues just for fun. I only won one game this week in one of my fun leagues. My current records are 0-3 and 0-3 in my money leagues. 1-2 and 1-2 in my fun leagues. How embarrassing is that for a "fantasy sports professional." Also wrapping up my one season long baseball league a keeper league. Its a rotisserie league so it's pretty much over for me. I'm in fourth place out of ten just trying to finish as high as possible. The one redeeming takeaway is I made a trade to get Kris Bryant. We have to keep one player and we have the option of keeping a 2nd player. I already had Mike Trout so I have a nice foundation to work with for next year. Despite the bloodbath in football I still finished the week with a 12% ROI (return on investment). Definitely not getting that from my 401k plan or my bank account that's for sure! If there was ONE skill that you could master for fantasy sports, I would say that skill is bankroll management. Bankroll management is critically important for long term success in playing fantasy sports for profit. 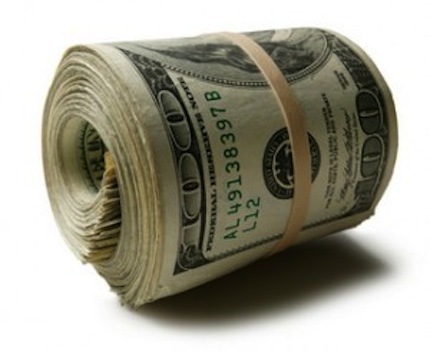 A bankroll is the amount of money that you have available to play fantasy sports. That amount of money is going to be different for everybody based on their unique circumstances and financial situation. Some players mistakenly believe that their bankroll is the amount of money they have in their fantasy accounts. That is incorrect for several reasons. What if you only have $25 in your fantasy account? If you lost the $25, would you stop playing fantasy sports completely? Or would you make another deposit? If the answer is you would make another deposit, then $25 is not your bankroll. On the flip side, what if you won a $1,000,000 prize in a fantasy sports contest and you have a million dollars sitting in your fantasy account. Is your bankroll a million? Probably not. Your actual bankroll is likely going to be significantly less than the full million that you have in your account. So the first question you want to ask yourself is "How much money do you have currently available to play fantasy sports?" Calculate what that number is regardless of whether you have all of that money in the account or not. For example, let's say you work a job and you have $25 a month that you can budget to playing fantasy sports. That money is available the 1st of every month and you currently have $75 in your site account right now, all money available to play games. Your current bankroll as of today would be $75. If by the 1st of the month you still have the $75, your new bankroll would be $100 even if you did not feel the need to deposit the additional $25. As long as you have the $25 somewhere (i.e. checking account, savings account, etc), it would be considered a part of your bankroll. Once you decide what your bankroll is, the next step is to decide how much money you feel comfortable playing with in a giving day of contests. You should decide on a percentage of your total bankroll that you feel comfortable playing with. For example, on MOST nights I play no more than 5% of my total bankroll. Periodically I may go as high as 10% of my total bankroll, but never more than 10%. Here is why it is important to decide on a percentage of bankroll and stick with it. One of my friends told me a story about a friend of his. This guy played in a tournament and won a 5 figure prize. However, he didn't have a bankroll management strategy like I am suggesting today. Therefore, he played the full five figures in more games and lost ALL OF IT and THEN SOME!!! Having a bankroll percentage that you commit to avoids this as you will never play more than your agreed upon percentage each day. In fantasy sports no matter how good you are, you will go through winning streaks and losing streaks. A good bankroll management strategy allows you to be able to survive the losing streaks. The smaller the percentage you play with, the longer you will be able to survive losing streaks. As an example, suppose you have a total bankroll of $100. You play fantasy football each week. If you play the full $100 and you lose all of it, guess how much money you have left? $0. You are now finished for the season. Let's say you have a total bankroll of $100 and you play 50% of your bankroll every week. How long would it be before you ran out of money if you lost all your money every week? Week 1 = $100 bankroll. Play 50% ($50). Lose All. New bankroll $50. Week 2 - $50 bankroll. Play 50% ($25). Lose All. New bankroll $25. Week 3 - $25 bankroll. Play 50% ($12.50) Lose All. New bankroll $12.50. After 4 weeks of losing your have lost almost 95% of your entire bankroll. That's not even a quarter of the NFL football season and your bankroll is almost gone. Now, let's say you have a total bankroll of $100 and you play 10% of your bankroll every week. How long would it be before you ran out of money if you lost all your money each week? Week 1 = $100 bankroll. Play 10% ($10). Lose All. New bankroll $90. Week 2 = $90 bankroll. Play 10% ($9). Lose All. New bankroll $81. Week 3 = $81 bankroll. Play 10% ($8). Lose All. New bankroll $73. Week 4 = $73 bankroll. Play 10% ($7). Lose All. New bankroll $66. Week 5 = $66 bankroll. Play 10% ($6.50). Lose All. New bankroll $59.50. Week 6 = $59.50 bankroll. Play 10% ($6). Lose All. New bankroll $53.50. Week 7 = $53.50 bankroll. Play 10% ($5). Lose All. New bankroll $48.50. In this scenario it would take you SEVEN straight weeks of complete and total losses just to get down to half of your bankroll gone. Why? Because you have a bankroll strategy that allows you to minimize your losses. Next week, I will talk about game selection. However, what's great about fantasy sports is there are contests where you can win 1000 times your contest entry fee. Some, you can win even more. You win a million dollar tournament with a $20 entry fee and you are looking at a win of 50,000 times your entry fee. The most I have ever won personally is 1500 times my contest entry fee. Having a bankroll management strategy allowed me to minimize my losses until I was able to have a big win. That big win allowed me to take my profits AND increase my available bankroll all at the same time. However, if you don't have a bankroll management strategy and you lose, you won't have the money to be around so that you can even have a chance to win a big contest. So before you begin to play consistently, decide what your bankroll is going to be. Then decide what your bankroll percentage is going to be. Let me know if you need any help with this. I would be more than happy to help you! The Return Of The Fantasy Sports Professional! 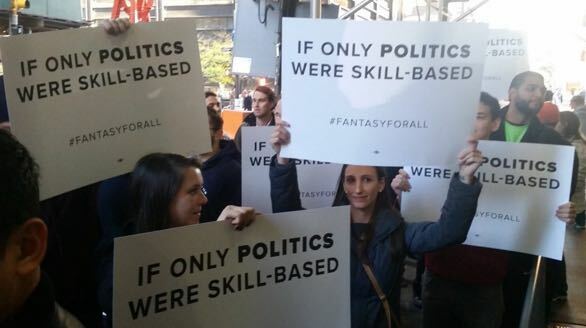 Daily Fantasy Sports has officially returned to New York! On August 24th, Daily Fantasy websites officially received the go ahead from the state of New York to resume operation in the state. I actually haven't had enough time to update this blog. Reason being? You guessed it. I've been so busy playing the games again! This week will make a month since the games have returned and now that I have gotten my fantasy sports research back into my regular daily routine, I now have the ability to be able to once again write blog posts on this site. This blog is going to be updated on a weekly basis. New posts will be available every Monday morning at 9:00am Eastern time. I will be also posting daily updates to the Fantasy Sports Professional fan page. If you are on Facebook (who isn't on Facebook these days? ), go ahead and give us a follow. Here's the premise behind this blog. My desire is to become a full time fantasy sports professional. I want to play fantasy sports full time for a living and have that be one of my primary sources of income. My other source of income will come from helping others who also have a desire to earn income from sports. You can learn more about that on my company blog, Sports 4 Profit. I will be updating the company blog more frequently. My goal is to updated it once per day. On this blog here, once a week, I will be sharing with you my journey as I go from a serious part time player to becoming a full time player. I will share with you the ups as well as the downs. In addition, I will share some very important tips and lessons learned that will help you to become a better fantasy sports player. I will be covering both season long fantasy sports as well as daily fantasy sports as I participate in both types of contests. Currently, I am known as a flyweight contender. This means that I participate in small stake fantasy sports contests. Rotogrinders is the largest community of fantasy sports players in the world. They currently have over 34,000 players who are registered with their site and are currently ranked based on their ability to win large stake tournaments in a variety of different fantasy sports. As of the time of this blog post, my official Rotogrinders rating is 11,910 out of 34,592. This puts me in the top 35% of all ranked fantasy sports players in the world today. In addition, as a flyweight contender, my official Rotogrinders rating is 2,570 out of 13,335. This puts me in the top 19% of all fantasy sports players that participate in the smallest stake fantasy sports contests like I do. Finally, in terms of my profits, I am currently playing completely with profits and re-investing all income back into playing. When I took 1st place and 3rd place in my first big tournament, I made a withdrawal and took out 5 times my original investment. I left the remaining amount in my account and play with that. This allows me a huge safety net because even if I lost every dollar that I have in my account currently, I would still be up 5 times what I initially invested into playing the games. My current goal is to build my bankroll to the point where I can actually produce a monthly income playing fantasy sports. Once my monthly income from playing fantasy sports consistently exceeds my monthly income from my job AND I have built up at least 3 years of living expense savings, I will then quit my job and pursue fantasy sports full time. So make sure you check this blog out every week and get an update on how I am doing as well as any lessons learned that I will be able to share with you! On Friday, June 19th, the New York Assembly passed a bill to make fantasy sports legal in the state of New York. Officially titled: AN ACT to amend the racing, pari-mutuel wagering and breeding law, in relation to the registration and regulation of interactive fantasy sports contests. The bill passed in bi-partisan fashion by a vote of 91-22. 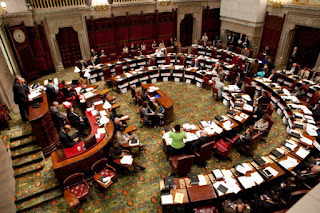 On Saturday, June 20th, the New York Senate also passed a bill to make fantasy sports legal in the state of New York. On the senate side, the bill also passed in bi-partisan fashion by a vote of 45 to 17. The ball is now in Governor Andrew Cuomo's court. All he has to do is sign off on the bill and fantasy sports will once again become legal in the state of New York. This entire drama began when New York State Attorney General Eric Schneiderman declared that fantasy sports was considered illegal gambling under New York State Law. The fantasy sports sites disagreed and the AG filed suit against them. In the first round, the judge ruled in the favor of the Attorney General. However, a panel of judges ruled in favor of the fantasy sites. The site operators remained open in the state of New York during this time period. However, they eventually struck a deal with the attorney general agreeing to cease operations. In return, the AG agreed to drop the lawsuit if the New York Legislature and Governor signs a law legalizing fantasy sports. The Legislature has done its part. Now it is up to Governor Cuomo to do his part and sign the bill into law. Assuming Governor Cuomo signs the bill into law...his spokesman commented today saying that the bill is "under review" the fantasy sports websites would need to register in the state. However, all sites that were operating in New York prior to the shutdown will be able to launch again as soon as they register, without having to wait for their site to get approved. New websites however will need to wait for approval. From a personal standpoint, this is very exciting news to me. Currently, the only way I can play is when I am outside of New York City. I typically go to New Jersey and Connecticut a few times a month so I can play over there. However, that is nowhere near the amount of time I use to play and it has hindered my ability to earn an income playing the games I love. There is also a matter of momentum. Being able to play daily and doing daily research gives you a significant advantage because you are able to spot trends. By only being able to play periodically I am not able to take advantage of this. I am looking forward to Governor Cuomo signing the bill into law and am hopefully optimistic that the sites will be back up and running in the state of New York by July. In the meantime, here is what I will be doing and what I recommend that you do if you are in New York and are awaiting for the Governor's signature and for the sites to get up and running. Decide on your budget and stick with it. Once I found out I could still play in other states, I never took my money out of my account. So once I am playing regularly again, the money is waiting for me to play with. If you need to make a deposit, pick an amount that you can afford to lose. Don't be stupid with your money! No matter how "good" you think you are there will be good days and bad days. Decide on a percentage of your bankroll that you are willing to play with each day and NEVER GO OVER THAT PERCENTAGE FOR ABSOLUTELY ANY REASON!!!! This is my single biggest secret to why I have been successful. I have set a budget of 5% of my total bankroll and I NEVER go over that amount. Because my percentage is fixed, when I win games, I'm automatically playing in MORE games and when I am losing I'm automatically playing in LESS games. This allows my bankroll to survive. Start getting back into the habit of doing research daily again. By getting back into the research mode, by the time the sites are back up and running you will be in your grove. I recommend keeping track of your scores and seeing how your lineups do so you can have an idea if you are doing well or not. Over the next several weeks, I will be posting a number of articles to help you get up and running so that you can be successful. I'll be talking about baseball and mixed martial arts because those are the two sports I play right now. Once football season starts in the Fall, I will start writing articles about that. Welcome To The Fantasy Sports Professional Blog! My name is Roosevelt Cooper and I am the founder and editor of this blog. I have been playing fantasy sports casually for over 19 years. I was introduced to the concept when I was 18 years old in college. I started off competing online on Yahoo Fantasy Sports. My first sport was a fantasy baseball league. As a sports fan, fantasy sports was a match made in heaven for me. As a child I was a huge sports fan and still am today. I was never good enough to play at a high level to have ANY chance of going professionally. However, I was always very knowledgeable about the games. In High School I was the sports editor for my school newspaper. One of my biggest regrets to this day was making the decision to go into information technology as oppose to going into sports journalism. Had I known about the proliferation of ESPN and sports back in 1996, you might be seeing me arguing with Stephen A Smith or Skip Bayless right now! In any case, in my first year of college, I was introduced to fantasy sports. I started off by playing fantasy baseball on the Yahoo Fantasy Sports website, which is still in existence today. I eventually branched off to playing fantasy basketball, fantasy football, as well as fantasy e-wrestling. I stopped playing e-wrestling after college. However, I continued to play fantasy basketball, baseball and football after college all throughout my adult years. I eventually started playing in "money leagues." Money leagues are season long fantasy leagues where each participant pays an entry fee and compete for a cash prize. For many years, I played in both leagues for fun as well as leagues for money. In 2014, I started seeing advertisements for daily fantasy sports leagues. Unlike season long leagues where you complete for a full season, daily fantasy leagues are one day leagues where you complete for cash prizes. I started playing on a site called DraftDaily. It was a lot of fun and I even won some prizes as well. I eventually moved over to DraftKings and started playing on there. In 2015, I made a decision to take this a little more seriously. I set a goal to be able to begin to earn a living from playing fantasy sports. I was fortunate enough to be able to turn a $100 initial investment to over $1700! I took $1000 out and I have been playing with my profit ever since! In 2016, I was really excited of being able to play my second full year. Unfortunately the attorney general of the state of New York where I live announced that Daily Fantasy Sports is illegal. So I currently have only been able to play whenever I go out of state to New Jersey or Connecticut. However, the good news is that the New York legislature is working furiously to bring fantasy sports back to New York. I anticipate that by the end of this month, daily fantasy sports will be legal once again in New York. On this blog, I will be sharing with you strategies, tactics, news, stories and my personal experiences in my journey as a fantasy sports professional. I hope that this blog will serve as a source of inspiration for you if you desire to play fantasy sports for profit as well.